Square General Contracting Company was established in 1977. We at Square are proud to be leaders in the field of building construction, and hence the development of the United Arab Emirates as a whole. Square General Contracting Company began as a small contracting company handling steel fabrication and MEP projects. Since then Square has evolved into a large multi-disciplinary contractor capable of handling large turnkey building construction projects. Square currently employs a workforce of 2,853 employees and aim to increase this number to 4,000 by the end of the year. There are 300 engineers, quantity surveyors, QA/QC inspectors, foremen, superintendents and safety officers currently employed at Square General Contracting Company. 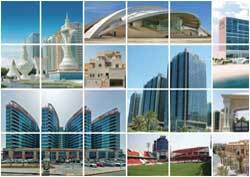 Our vision is to be the best and most respected construction, and building products, company currently operating in the UAE. Our mission is to build long term, mutually productive and profitable relationship with our clients and suppliers through professional work ethics. We are dedicated to providing excellent service in construction and the prefabrication of construction items. We ensure quality of the work, safety of the team and environment and on-time handover of projects. At Square we value teamwork, integrity, mutual respect, initiative, innovation and loyalty. Our team is dedicated to working together to achieve the goals of the company. It is this work ethic that is behind the success of Square General Contracting Company. The management of Square’s dedication to quality and efficient management has led us to becoming one of the first companies in the UAE to earn the ISO9001:2000 Certificate for “Construction and Maintenance of Civil, Electrical and Mechanical Works”. All management processes and procedures go through rigorous internal audits so as to guarantee maximum efficiency. Square General Contracting Company takes all necessary measure to ensure that all its employees are safe from injury and risk while at work on-site, as well as in the factories. We make sure that all work practices and procedures adopted in the activities of the company will comply with the Acts, Regulations, Code of Practice and Guidelines governing occupational health and safety. It is the policy of Square General Contracting Company to ensure, as it is reasonably practicable, that all employees are safe from injury and risk to health while at work. SGCC meets this commitment by ensuring that work practices and procedures adopted through its activities will constantly comply with the Acts, Regulations, Code of Practices and Guidelines governing occupational health and safety. All employees are expected to take all practical and necessary measures to ensure a safe and healthy work environment. The Management of SGCC has the responsibility to monitor and maintain the safe working environment and conditions at any work place that is under the management and control of the company. Those persons with a supervising role are responsible for ensuring that all employees under their control work in a safe manner and report any health or safety hazard to the Management. Employees, in their own interest and obligation, have the responsibility to ensure that nothing is done to make health and safety provisions less effective. Finally, our aim is to integrate the management of occupational health and safety with the management of all other major functions of the company.